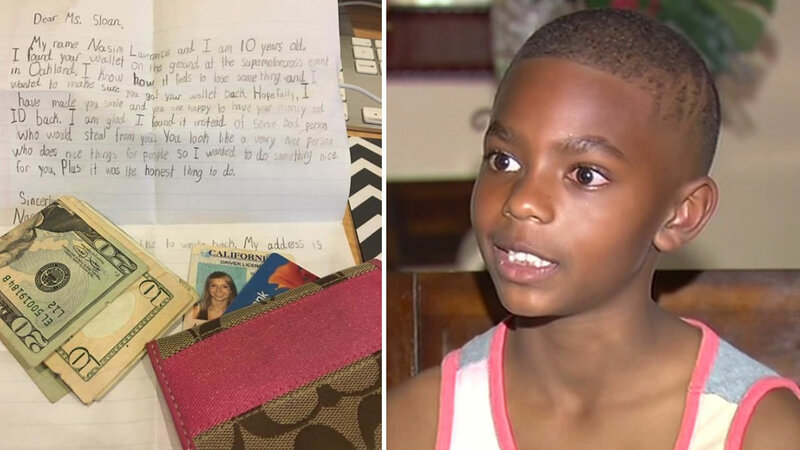 ANTIOCH, CA -- A 10-year-old boy from Antioch has been thrust into the social media spotlight after doing a good deed. ABC7 News spoke exclusively with him about how returning a lost wallet created a viral sensation. When Nasim Lawrence found a wallet containing a woman's driver's license, a debit card, and $38 in cash, he knew right away he had to return it to its rightful owner. "I wanted to make her happy and make her feel better about her losing something," he said. So his mother, Karimah Lawrence, helped him mail the wallet the next day. But his dad, AJ Lawrence, says his concern for the woman didn't end there. "He said, 'Well, dad, do you think we're going to get it to her before she has to go to the DMV?' said AJ. "He didn't want her to stand in the DMV line." Taylor Sloan says she lost the wallet on Jan. 30 while at a motocross event in Oakland. "I had my wallet in the back of my pocket and probably just lost it when I sat down in my seat," she said. "I didn't see it was lost until the event was over." What touched her heart was the sweet letter that Nasim wrote to her. He told her that he knew what it was like to lose something and that she looked like a very nice person. "The fact that he took the time to write it and it was so cute and my favorite line was -- I'm glad I got it instead of some bad person," said Sloan. In fact, Sloan was so moved, she posted the wallet and letter on Facebook. From there, it went viral. "His dad picked him up and was like, 'My principal said I'm a celebrity," said Karimah. "And I was like, 'What is going on?'" Sloan has since written back to Nasim thanking him. She also gave him a bag of candy, and a $20 reward. "It feels kind of odd because I've never got this fame before," said Nasim. When asked if he likes it, Nasim said, "Yeah, it's surprising." A 10-year-old boy now a viral sensation for doing what he says was "the honest thing to do."